The Annexes are hereby amended in accordance with the Annex to this Directive. if the vehicles comply with the requirements of Directive 70/220/EEC, as amended by this Directive. for a new vehicle type on grounds relating to air pollution by emissions if it fails to comply with the provisions of Directive 70/220/EEC, as amended by this Directive. For the Type I test the limit values set out in row A of the table in section 5.3.1.4 of Annex I to Directive 70/220/EEC are to be used. on grounds relating to air pollution by emissions, if the vehicles fail to comply with the provisions of Directive 70/220/EEC, as amended by this Directive. For the Type I test the limit values set out in row A of the table in section 5.3.1.4 of Annex I to Directive 70/220/EEC are to be used. for a new type of vehicle on grounds relating to air pollution by emissions if it fails to comply with the provisions of Directive 70/220/EEC, as amended by this Directive. For the Type I test the limit values set out in row B of the table in Section 5.3.1.4 of Annex I to Directive 70/220/EEC are to be used. shall be considered, for the purposes of paragraphs 2 and 3, as vehicles in Category N1. with effect from 1 January 2002, for vehicles in Category N1, Classes II and III, vehicles designed to carry more than six occupants including the driver and vehicles the maximum mass of which exceeds 2 500 kg. 8. Until the dates referred to in paragraphs 2 and 3 type-approval may be granted and conformity-of-production verifications carried out in accordance with Directive 70/220/EEC as amended by Directive 96/69/EC. examination of Type V testing, including the possibility of abolishing it. requirements for the operation of an on-board measurement system (OBM). the contribution that selective and differentiated fiscal measures could make to reducing vehicle emissions without any negative impact on the functioning of the internal market, taking into account the effects of revenue losses on neighbouring countries. 1. By 1 January 2000, the Commission shall submit a report to the European Parliament and the Council on the drawing up of a standard electronic format for repair information taking account of relevant international standards. By 30 June 2002 the Commission shall submit a report to the European Parliament and the Council on the development of on-board diagnostics (OBD) giving its opinion on the need for an extension of the OBD procedure and on requirements for the operation of an on-board measurement system (OBM). On the basis of the report, the Commission will submit a proposal for measures to enter into force no later than 1 January 2005 to include the technical specifications and corresponding annexes in order to provide for the type approval of OBM systems ensuring at least equivalent levels of monitoring to the OBD system and which shall be compatible with these systems. The Commission shall submit a report to the European Parliament and the Council on the extension of OBD to cover other electronic vehicle control systems relating to active and passive safety, inter alia in a manner which is compatible with emission control systems. 2. By 1 January 2001 the Commission shall take appropriate measures to ensure that replacement or retro-fitted components can be brought to the market. Such measures shall include suitable approval procedures for replacement parts to be defined as soon as possible for those emission control components that are critical to the correct functioning of OBD systems. 3. By 30 June 2000 the Commission shall take appropriate measures to ensue that the development of replacement or retro-fit components which are critical to the correct functioning of the OBD system is not restricted by the unavailability of pertinent information, unless that information is covered by intellectual property rights or constitutes specific know-how of the manufacturers or the OEM (Original Equipment Manufacturers) suppliers: in this case the necessary technical information shall not be improperly withheld. 4. In addition the Commission shall submit, by 30 June 2000, appropriate proposals to ensure that spare and retrofit parts are compatible inter alia with the specifications of the appropriate on-board diagnostic system, so that repair, replacement and fault-free operation are possible. The type-approval procedure laid down in the Annex to this Directive shall serve as a basis for this. for each type of motor vehicle, they shall not exceed the additional cost of the technical solutions introduced to ensure compliance with the values set in Article 2(3) or Article 2(5) and of their installation on the vehicle. The Commission shall be informed in sufficient time of plans to institute or change the incentives referred to in the first subparagraph, so that it can submit its observations. Member States may inter alia introduce tax or financial incentives for the re-equipment of in-use vehicles to meet the values laid down in this Directive or previous amendments to Directive 70/220/EEC, and for laying up vehicles which do not comply. Rules for a type-approval for vehicles with alternative propulsion systems and vehicles using alternative fuels shall be further defined as appropriate. This Directive shall be brought into effect at the same time as, and in accordance with the same timetable for, the introduction of measures specified in Directive 98/70/EC (22). 1. Member States shall adopt and publish the laws, regulations and administrative provisions necessary to comply with this Directive with effect as from nine months after this Directive enters into force. They shall forthwith inform the Commission thereof. OJ C 106, 4.4.1997, p. 6. (2) OJ C 206, 7.7.1997, p. 113. (3) Opinions of the European Parliament of 10 April 1997 and of 18 February 1998, (OJ C 132, 28.4.1997, p. 170 and OJ C 80, 16.3.1998, p. 128), Common Positions of the Council of 7 October 1997 and of 23 March 1998 (OJ C 351, 19.11.1997, p. 13 and OJ C 161, 27.5.1998, p. 45), and Decisions of the European Parliament, second reading, of 30 April 1998 (OJ C 152, 18.5.1998, p. 41) and, third reading of 15 September 1998 (not yet published in the Official Journal). Decision of the Council of 17 September 1998. (4) OJ C 112, 20.12.1973, p. 1. (6) OJ L 76, 6.4.1970, p. 1. Directive as last amended by Directive 96/69 of the European Parliament and of the Council (OJ L 282, 1.11.1996, p. 64). (7) OJ L 159, 15.6.1974, p. 61. (8) OJ L 32, 3.2.1977, p. 32. (9) OJ L 223, 14.8.1978, p. 48. (10) OJ L 197, 20.7.1983, p. 1. (11) OJ L 36, 9.2.1988, p. 1. (12) OJ L 214, 6.8.1988, p. 1. (13) OJ L 100, 19.4.1994, p. 42. (14) OJ L 226, 3.8.1989, p. 1. (15) OJ L 242, 30.8.1991, p. 1. (16) OJ L 186, 28.7.1993, p. 21. (17) OJ L 282, 1.11.1996, p. 64. (18) OJ L 42, 23.2.1970, p. l. Directive as last amended by Directive 96/27/EC of the European Parliament and of the Council (OJ L 169, 8.7.1996, p. 1). (19) OJ L 210, 20.8.1996, p. 25. (20) OJ L 375, 31.12.1980, p. 36. Directive as last amended by Commission Directive 93/116/EC (OJ L 329, 30.12.1993, p. 39). (21) OJ C 102, 4.4.1996, p. 1. (22) See page 58 of this Official Journal. ‘SCOPE, DEFINITIONS, APPLICATION FOR EC TYPE-APPROVAL, GRANTING OF EC TYPE-APPROVAL, REQUIREMENTS AND TESTS, EXTENSION OF EC TYPE-APPROVAL, CONFORMITY OF PRODUCTION AND IN-SERVICE VEHICLES, ON-BOARD DIAGNOSTIC (OBD) SYSTEMS’. ‘OBD’ an on-board diagnostic system for emission control which has the capability of identifying the likely area of malfunction by means of fault codes stored in computer memory. ‘In-service test’ means the test and evaluation of conformity conducted in accordance with section 7.1.7 of this Annex. ‘Properly maintained and used’ means, for the purpose of a test vehicle, that such a vehicle satisfies the criteria for acceptance of a selected vehicle laid down in section 2 of Appendix 3 to this Annex. The application for EC type-approval pursuant to Article 3 (4) of Directive 70/156/EEC of a vehicle type with regard to its tailpipe emissions, evaporative emissions, durability of anti-pollution devices as well as to its on-board diagnostic (OBD) system must be submitted by the vehicle manufacturer. Should the application concern an on-board diagnostic (OBD) system the procedure described in Annex XI, section 3 must be followed. if applicable, the particulars of the vehicle family as referred to in Annex XI, Appendix 2. For the tests described in section 3 of Annex XI, a vehicle representative of the vehicle type or vehicle family fitted with the OBD system to be approved must be submitted to the technical service responsible for the type-approval test. If the technical service determines that the submitted vehicle does not fully represent the vehicle type or vehicle family described in Annex XI, Appendix 2, an alternative and if necessary an additional vehicle must be submitted for test in accordance with section 3 of Annex XI. 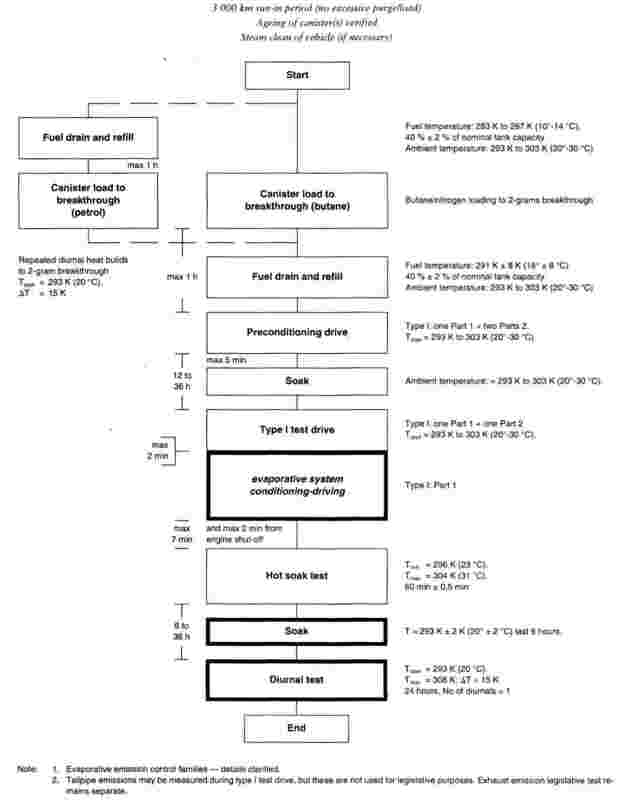 A model of the information document relating to tailpipe emissions, evaporative emissions, durability and the on-board diagnostic (OBD) system is given in Annex II. If the relevant requirements are satisfied, EC type-approval is granted pursuant to Article 4 (3) of Directive 70/156/EEC. the California Code of Regulations, Title 13, Sections 1960.1 (f) (2) or (g) (1) and (g) (2), 1960.1 (p) applicable to 1996 and later model year vehicles, 1968.1, 1976 and 1975, applicable to 1995 and later model year light-duty vehicles, published by Barclay's Publishing. ‘The technical measures taken by the manufacturer must be such as to unsure that the tailpipe and evaporative emissions are effectively limited, pursuant to this Directive, throughout the normal life of the vehicle and under normal conditions of use. This will include the security of those hoses and their joints and connections, used within the emission control systems, which must be so constructed as to conform with the original design intent. For tailpipe emissions, these provisions are deemed to be met if the provisions of sections 5.3.1.4 (type-approval) and section 7 (conformity of production and in-service vehicles) respectively are complied with. ‘The use of a defeat device is prohibited.’. Provision must be made to prevent excess evaporative emissions and fuel spillage caused by a missing fuel filler cap. Any vehicle with an emission control computer must include features to deter modification, except as authorised by the manufacturer. The manufacturer shall authorise modifications if these modifications are necessary for the diagnosis, servicing, inspection, retrofitting or repair of the vehicle. Any reprogrammable computer codes or operating parameters must be resistant to tampering and the computer and any related maintenance instructions must conform to the provisions in ISO DIS 15031-7. Any removable calibration memory chips must be potted, encased in a sealed container or protected by electronic algorithms and must not be changeable without the use of specialized tools and procedures. Computer-coded engine operating parameters must not be changeable without the use of specialized tools and procedures (e. g. soldered or potted computer components or sealed (or soldered) computer enclosures). In the case of mechanical fuel-injection pumps fitted to compression-ignition engines, manufacturers must take adequate steps to protect the maximum fuel delivery setting from tampering while a vehicle is in service. Manufacturers may apply to the approval authority for an exemption to one of these requirements for those vehicles which are unlikely to require protection. The criteria that the approval authority will evaluate in considering an exemption will include, but are not limited to, the current availability of performance chips, the high-performance capability of the vehicle and the projected sales volume of the vehicle. Type VI test (verifying the average low ambient temperature carbon monoxide and hydrocarbon tailpipe emissions after a cold start). This test must be carried out on all M1 and N1 Class I (9) vehicles equipped with a positive-ignition engine, except vehicles designed to carry more than six occupants and vehicles whose maximum mass exceeds 2 500 kg. The vehicle is placed on a chassis dynamometer equipped with a means of load an inertia simulation. The test consists of the four elementary urban driving cycles of part one of the Type I test. The Part One test is described in Annex III, Appendix 1 and illustrated in figures III.1.1 and III.1.2 of the Appendix. The low ambient temperature test lasting a total of 780 seconds must be carried out without interruption and start at engine cranking. The low ambient temperature test must be carried out at an ambient test temperature of 266 oK (-7 oC). Before the test is carried out the test vehicles must be conditioned in a uniform manner to ensure that the test results may be reproducible. The conditioning and other test procedures are carried out as described in Annex VII. During the test the exhaust gases are diluted and a proportional sample collected. The exhaust gases of the vehicle tested are diluted, sampled and analysed, following the procedure described in Annex VII, and the total volume of the diluted exhaust is measured. The diluted exhaust gases are analysed for carbon monoxide and hydrocarbons. Notwithstanding the requirements of 5.3.5.2, for each pollutant, not more than one of the three results obtained may exceed the limit prescribed by not more than 10 %, provided the arithmetical mean value of the three results is below the prescribed limit. Where the prescribed limits are exceeded for more than one pollutant it is immaterial whether this occurs in the same test or in different tests. The number of tests prescribed in 5.3.5.2 may, at the request of the manufacturer, be increased to 10 provided that the arithmetical mean of the first three results falls between 100 % to 110 % of the limit. In this case, the requirement after testing is only that the arithmetical mean of all 10 results must be less than the limit value. The number of tests prescribed in 5.3.5.2 may be reduced according to 5.3.5.3.1 and 5.3.5.3.2. Only one test is performed if the result obtained for each pollutant of the first test is less than or equal to 0,70 L.
If the requirement of 5.3.5.3.1 is not satisfied, only two tests are performed if for each pollutant the result of the first test is less than or equal to 0,85 L and the sum of the first two results is less than or equal to 1,70 L and the result of the second test is less than or equal to L.
This requirement applies to all vehicles powered by a positive-ignition engine for which EC type-approval is sought in accordance with this Directive. the engine speed during the test must be recorded, including any tolerances. the Lambda value (11) must be recorded. The engine oil temperature at the time of the test must be measured and recorded. The table in section 1.9 of the Appendix to Annex X must be completed. The manufacturer must confirm the accuracy of the Lambda value recorded at the time of type-approval in section 5.3.7.3 as being representative of typical production vehicles within 24 months of the date of the granting of type-approval by the technical service. An assessment must be made on the basis of surveys and studies of production vehicles. Fore each of the transmission rations used in the type I and type VI tests, ... (rest unchanged). If, for each gear ratio, E ≤ 8 %, the extension is granted without repeating the type I and type VI tests. Measures to ensure the conformity of production must be taken in accordance with the provisions of Article 10 of Directive 70/156/EEC, as last amended by Directive 96/27/EEC (whole vehicle type-approval). That Article entrusts the manufacturer with the responsibility for taking measures to ensure the conformity of production to the type approved. Conformity of production is checked on the basis of the description in the type-approval certificate set out in Annex X to this Directive. As a general rule, conformity of production with regard to limitation of tailpipe and evaporative emissions from the vehicle is checked on the basis of the description in the type-approval certificate set out in Annex X and, where necessary, of all or some of the tests of types I, II, III and IV described in section 5.2. With reference to type-approvals granted for emissions, these measures must also be appropriate for confirming the functionality of the emission control devices during the normal useful life of the vehicles under normal conditions of use (conformity of in-service vehicles properly maintained and used). For the purpose of this Directive these measures must be checked for a period of up to 5 years of age or 80 000 km, whichever is the sooner, and from 1 January 2005, for a period of up to five years of age or 100 000 km, whichever is the sooner. Audit of in-service conformity by the type-approval authority is conducted on the basis of any relevant information that the manufacturer has, under procedures similar to those defined in Article 10 (1) and (2), and in Annex 10 (1) and (2) of Directive 70/156/EEC. Sections 7.1. to 7.1.3 are renumbered as 7.1.3 to 7.1.5. When the approval authority determines that the quality of production seems unsatisfactory a vehicle is randomly taken from the series and subjected to the tests described in Annex XI, Appendix 1. The production is deemed to conform if this vehicle meets the requirements of the tests described in Annex XI, Appendix 1. If the vehicle taken from the series does not satisfy the requirements of section 7.1.6.1 a further random sample of four vehicles must be taken from the series and subjected to the tests described in Annex XI, Appendix 1. The tests may be carried out on vehicles which have been run in for no more than 15 000 km. decide that the information is insufficient or the conformity of vehicles in use is unsatisfactory, and proceed to have vehicles tested in accordance with Appendix 3 to this Annex. Where type I tests are considered necessary to check the conformity of emission control devices with the requirements for their performance while in service, such tests must be carried out using a test procedure meeting the statistical criteria defined in Appendix 4 to this Annex. The type-approval authority, in cooperation with the manufacturer, must select a sample of vehicles with sufficient mileage whose use under normal conditions can be reasonably assured. The manufacturer must be consulted on the choice of the vehicles in the sample and be allowed to attend the confirmatory checks of the vehicles. The manufacturer is authorized, under the supervision of the type-approval authority, to carry out checks, even of a destructive nature, on those vehicles with emission levels in excess of the limit values with a view to establishing possible causes of deterioration which cannot be attributed to the manufacturer himself (e. g. use of leaded petrol before the test date). Where the results of the checks confirm such causes, those test results are excluded from the conformity check. Where the type-approval authority is not satisfied with the results of the tests in accordance with the criteria defined in Appendix 4, the remedial measures referred to in Article 11 (2) and in Annex X to Directive 70/156/EEC are extended to vehicles in service belonging to the same vehicle type which are likely to be affected with the same defects in accordance with section 6 of Appendix 3. The plan of remedial measures presented by the manufacturer must be approved by the type-approval authority. The manufacturer is responsible for the execution of the remedial plan as approved. The type-approval authority must notify its decision to all Member States within 30 days. The Member States may require the same plan of remedial measures be applied to all vehicles of the same type registered in their territory. If a Member State has established that a vehicle type does not conform to the applicable requirements of Appendix 3 to this Annex, it must notify without delay the Member State which granted the original type-approval in accordance with the requirements of Article 11 (3) of Directive 70/156/EEC. Vehicles of Category M1 and N1 equipped with positive-ignition engines must be fitted with an onboard diagnostic (OBD) system for emission control in accordance with Annex XI. Where new types of compression-ingnition engined vehicles entering into service prior to this date are fitted with an OBD system, the provisions of sections 6.5.3 to 6.5.3.5 of Annex XI, Appendix 1, are applicable. New types of Category M1 exempted by section 8.2, and new types of vehicles in Category N1 class I equipped with compression-ignition engines, must, from 1 January 2005, be fitted with an on-board diagnostic (OBD) system for emission control in accordance with Annex XI. New types of vehicles in Category N1 Classes II and III equipped with compression-ignition engines must, from 1 January 2006, be fitted with on-board diagnostic (OBD) systems for emission control in accordance with Annex XI. Where compression-ignition engined vehicles entering into service prior to the dates given in this section are fitted with OBD systems, the provisions of sections 6.5.3 to 6.5.3.5 of Annex XI, Appendix 1, are applicable. Vehicles of other Categories or vehicles of Category M1 and N1 not covered by 8.1, 8.2 or 8.3, may be fitted with an on-board diagnostic system. In this case, sections sections 6.5.3 to 6.5.3.5 of Annex XI, Appendix 1, are applicable. This Appendix sets out the criteria referred to in section 7.1.7 of this Annex regarding the selection of vehicles for testing and the procedures for the in-service conformity control. The criteria for acceptance of a selected vehicle are defined in sections 2.1 to 2.8 of this Appendix. Information is collected by vehicle examination and an interview with the owner/driver. The vehicle must belong to a vehicle type that is type-approved under this Directive and covered by a certificate of conformity in accordance with Directive 70/156/EEC. It must be registered and used in the European Community. The vehicle must have been in service for at least 15 000 km or 6 months, whichever is the later, and for no more than 80 000 km or 5 years, whichever is the sooner. There must be a maintenance record to show that the vehicle has been properly maintained, e. g. has been serviced in accordance with the manufacturer's recommendations. The vehicle must exhibit no indications of abuse (e. g. racing, overloading, misfuelling, or other misuse), or other factors (e. g. tampering) that could affect emission performance. In the case of vehicles fitted with an OBD system, the fault code and mileage information stored in the computer are taken into account. A vehicle must not be selected for testing if the information stored in the computer shows that the vehicle has operated after a fault code was stored and a relatively prompt repair was not carried out. There must have been no unauthorized major repair to the engine or major repair of the vehicle. The lead content and sulphur content of a fuel sample from the vehicle tank must meet applicable standards and there must be no evidence of misfuelling. Checks may be done in the tailpipe, etc. There must be no indication of any problem that might jeopardize the safety of laboratory personnel. All anti-pollution system components on the vehicle must be in conformity with the applicable type-approval. Diagnosis and any normal maintenance necessary must be performed on vehicles accepted for testing, prior to measuring exhaust emissions, in accordance with the procedure laid down in section 3.1 to 3.7. The following checks must be carried out: checks on air filter, all drive belts, all fluid levels, radiator cap, all vacuum hoses and electrical wiring related to the antipollution system for integrity; checks on ignition, fuel metering and anti-pollution device components for maladjustments and/or tampering. All discrepancies must be recorded. The OBD system shall be checked for proper functioning. Any malfunction indications in the OBD memory must be recorded and the requisite repairs must be carried out. If the OBD malfunction indicator registers a malfunction during a preconditioning cycle, the fault may be identified and repaired. The test may be re-run and the results of that repaired vehicle used. The ignition system must be checked and defective components replaced, for example spark plugs, cables, etc. The compression must be checked. If the result is unsatisfactory the vehicle is rejected. The engine parameters must be checked to the manufacturer's specifications and adjusted if necessary. If the vehicle is within 800 km of a scheduled maintenance service, that service must be performed according to the manufacturer's instructions. Regardless of odometer reading, the oil and air filter may be changed at the request of the manufacturer. Upon acceptance of the vehicle, the fuel must be replaced with appropriate emission test reference fuel, unless the manufacturer accepts the use of market fuel. When a check on vehicles is deemed necessary, emission tests in accordance with Annex III to this Directive are performed on pre-conditioned vehicles selected in accordance with the requirements of sections 2 and 3 of this Appendix. Vehicles equipped with an OBD system may be checked for proper in-service functionality of the malfunction indication, etc., in relation to levels of emissions (e. g. the malfunction indication limits defined in Annex XI to this Directive) for the type-approved specifications. If a component or system operates in a manner not covered by the particulars in the type-approval certificate and/or information package for such vehicle types and such deviation has not been authorized under Article 5 (3) or (4) of Directive 70/156/EEC, with no malfunction indication by the OBD, the component or system must not be replaced prior to emission testing, unless it is determined that the component or system has been tampered with or abused in such a manner that the OBD does not detect the resulting malfunction. The test results are submitted to the evaluation procedure in accordance with Appendix 4 to this Annex. Test results must not be multiplied by deterioration factors. When the type-approval authority is certain that a vehicle type is not in conformity with the requirements of these provisions, it must request the manufacturer to submit a plan of remedial measures to remedy the non-compliance. The plan of remedial measures must be filed with the type-approval authority not later than 60 working days from the date of the notification referred to in section 6.1. The type-approval authority must within 30 working days declare its approval or disapproval of the plan of remedial measures. However, where the manufacturer can demonstrate, to the satisfaction of the competent type-approval authority, that further time is required to investigate the non-compliance in order to submit a plan of remedial measures, an extension is granted. The remedial measures must apply to all vehicles likely to be affected by the same defect. The need to amend the type-approval documents must be assessed. The manufacturer must provide a copy of all communications related to the plan of remedial measures, and must also maintain a record of the recall campaign, and supply regular status reports to the type-approval authority. The plan of remedial measures must include the requirements specified in 6.5.1 to 6.5.11. The manufacturer must assign a unique identifying name or number to the plan of remedial measures. 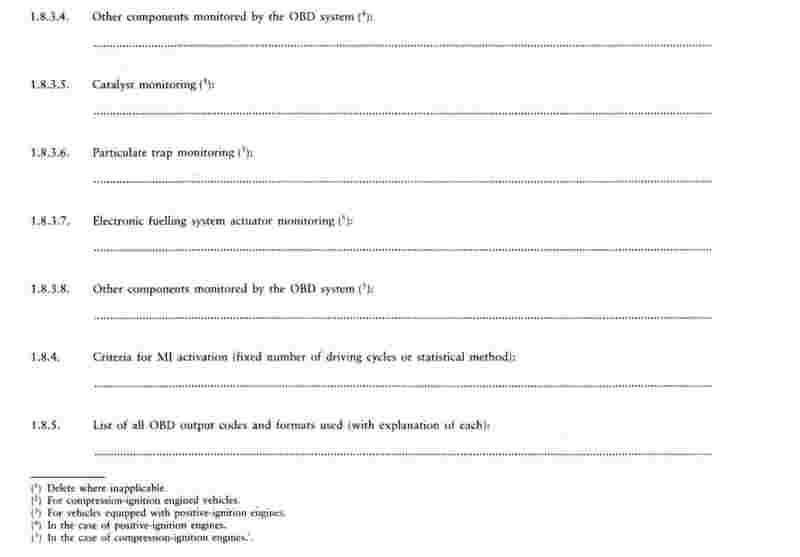 A description of the specific modifications, alterations, repairs, corrections, adjustments, or other changes to be made to bring the vehicles into conformity including a brief summary of the data and technical studies which support the manufacturer's decision as to the particular measures to be taken to correct the non-conformity. A description of the proper maintenance or use, if any, which the manufacturer stipulates as a condition of eligibility for repair under the plan of remedial measures, and an explanation of the manufacturer's reasons for imposing any such condition. No maintenance or use conditions may be imposed unless it is demonstrably related to the non-conformity and the remedial measures. A description of the procedure to be followed by vehicle owners to obtain correction of the non-conformity. This must include a date after which the remedial measures may be taken, the estimated time for the workshop to perform the repairs and where they can be done. The repair must be done expediently, within a reasonable time after delivery of the vehicle. A brief description of the system which the manufacturer uses to assure an adequate supply of component or systems for fulfilling the remedial action. It must be indicated when there will be an adequate supply of components or systems to initiate the campaign. A description of the impact of the proposed remedial measures on the emissions, fuel consumption, driveability, and safety of each vehicle type, covered by the plan of remedial measures with data, technical studies, etc. which support these conclusions. Where the plan of remedial measures includes a recall, a description of the method for recording the repair must be submitted to the type-approval authority. If a label is used, an example of it must be submitted. The manufacturer is responsible for keeping a record of every vehicle recalled and repaired and the workshop which performed the repair. The type-approval authority must have access to the record on request for a period of 5 years from the implementation of the plan of remedial measures. The repair and/or modification or addition of new equipment shall be recorded in a certificate supplied by the manufacturer to the vehicle owner. 1. This Appendix describes the procedure to be used to verify the in-service conformity requirements for the type I test. One dealing with vehicles identified in the sample, due to an emission-related defect, causing outliers in the results (section 3). The other dealing with the total sample (section 4). 3. PROCEDURE TO BE FOLLOWED WITH OUTLYING EMITTERS IN THE SAMPLE. A vehicle is said to be an outlying emitter, when for any regulated component the limit value as shown in section 5.3.1.4 of Annex I is exceeded significantly. With a minimum sample size of 3, and a maximum sample size as determined by the procedure of paragraph 4, the sample is scanned for the occurrence of outlying emitters. When an outlying emitter is found, the cause of the excess emission must be determined. When more than one vehicle is found to be an outlying emitter, due to the same cause, the sample is regarded as having failed. When only one outlying emitter has been found, or when more than one outlying emitter is found, but due to different causes, the sample is increased by one vehicle, unless the maximum sample size has already been reached. When in the increased sample more than one vehicle is found to be an outlying emitter, due to the same cause, the sample is regarded as having failed. When in the maximum sample size not more than one outlying emitter is found, where the excess emission is due to the same cause, the sample is regarded as having passed with regard to the requirements of section 3 of this Appendix. Whenever a sample is increased due to the requirements of 3.5, the statistical procedure of paragraph 4 is applied to the increased sample. 4. PROCEDURE TO BE FOLLOWED WITHOUT SEPARATE EVALUATION OF OUTLYING EMITTERS IN THE SAMPLE. 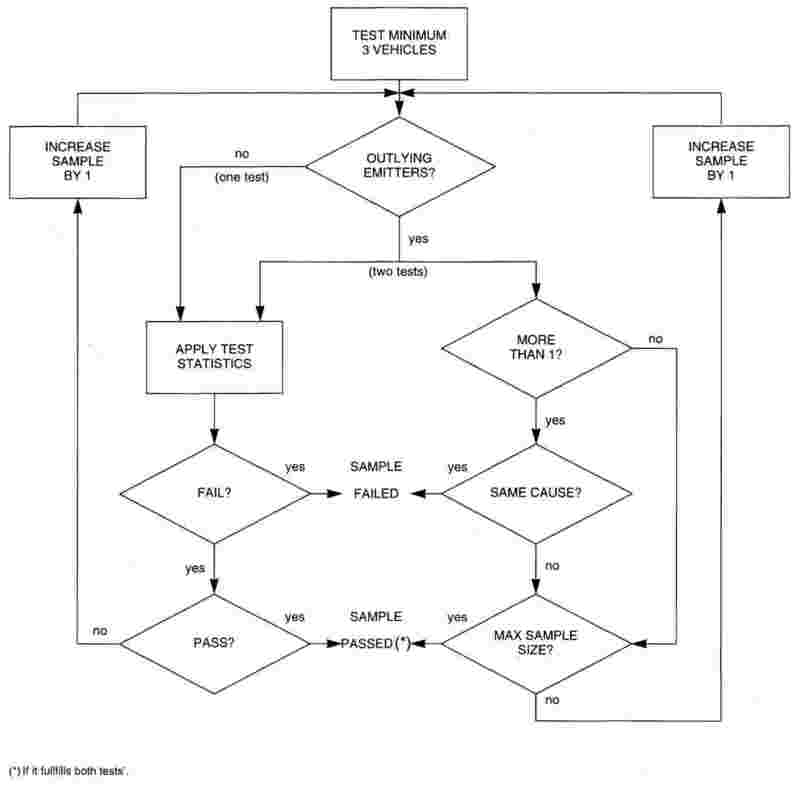 With a minimum sample size of three the sampling procedure is set so that the probability of a batch passing a test with 40 % of the production defective is 0,95 (producer's risk = 5 %) while the probability of a batch being accepted with 75 % of the production defective is 0,15 (consumer's risk = 15 %). 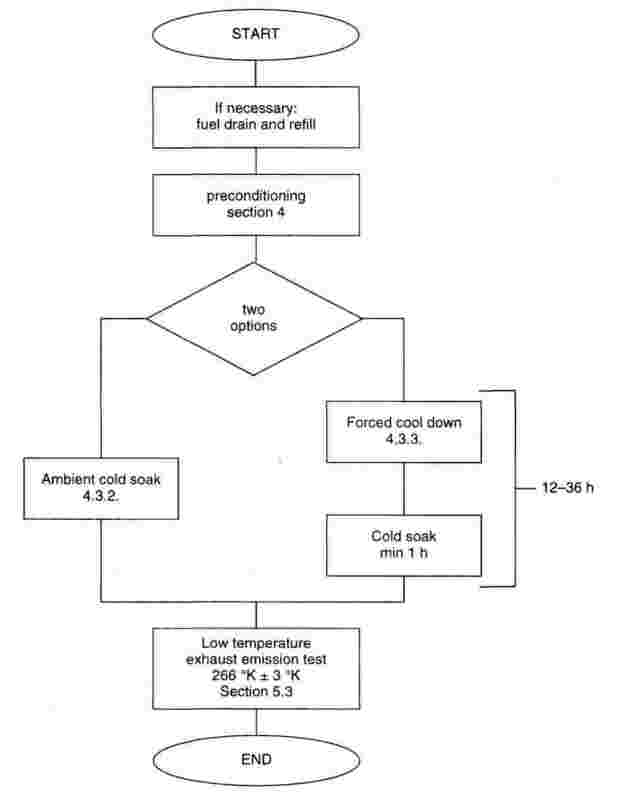 For each of the pollutants given in section 6.2.1 of Annex I, the following procedure is used (see Figure 1/7). The test statistic quantifying the number of non-conforming vehicles, i. e. xi > L, is computed for the sample. otherwise, an additional vehicle is tested and the procedure is applied to the sample with one extra unit. In the following table the pass and fail decision numbers are computed in accordance with the International Standard ISO 8422:1991. A sample is regarded as having passed the test when it has passed both the requirements of sections 3 and 4 of this Appendix. Paragraphs 2 and 3 are deleted. ‘Vehicles which do not attain the acceleration ... ’ (rest unchanged). Sections 4 to 4.3 including Table III.1.4 and Figure III.1.4 are deleted. This Annex describes the procedure for the Type IV test in accordance with section 5.3.4 of Annex I. This procedure describes a method for a determination of the loss of hydrocarbons by evaporation from the fuel systems of vehicles with positive-ignition engines. Mass emissions of hydrocarbons from the hot soak and the diurnal loss phases are added up to provide an overall result for the test. The vehicle must be in good mechanical condition and have been run in and driven at least 3 000 km before the test. The evaporative emission control system must be connected and have been functioning correctly over this period and the carbon canister(s) must have been subject to normal use, neither undergoing abnormal purging nor abnormal loading. The appropriate reference fuel must be used, as defined in Annex IX to this Directive. The chassis dynamometer must meet the requirements of Annex III. The evaporative emission measurement enclosure must be a gas-tight rectangular measuring chamber able to contain the vehicle under test. The vehicle must be accessible from all sides and the enclosure when sealed must be gas tight in accordance with Appendix 1. The inner surface of the enclosure must be impermeable and non-reactive to hydrocarbons. The temperature conditioning system must be capable of controlling the internal enclosure air temperature to follow the prescribed temperature versus time profile throughout the test, and an average tolerance of ± 1 K over the duration of the test. The control system must be tuned to provide a smooth temperature pattern that has a minimum of overshoot, hunting, and instability about the desired long-term ambient temperature profile. Interior surface temperatures must not be less than 278 oK (5 oC) nor more than 320 oK (55 oC) at any time during the diurnal emission test. Wall design must be such as to promote good dissipation of heat. Interior surface temperatures must not be below 293 oK (20 oC), nor above 325 oK (52 oC) for the duration of the hot soak test. To accommodate the volume changes due to enclosure temperature changes, either a variable-volume or fixed-volume enclosure may be used. The variable-volume enclosure expands and contracts in response to the temperature change of the air mass in the enclosure. Two potential means of accommodating the internal volume changes are movable panel(s), or a bellows design, in which an impermeable bag or bags inside the enclosure expand(s) and contracts(s) in response to internal pressure changes by exchanging air from outside the enclosure. Any design for volume accommodation must maintain the integrity of the enclosure as specified in Appendix 1 over the specified temperature range. Any method of volume accommodation must limit the differential between the enclosure internal pressure and the barometric pressure to a maximum value of ± 5 hPa. The enclosure must be capable of latching to a fixed volume. A variable volume enclosure must be capable of accommodating a ± 7 % change from its ‘nominal volume’ (see Appendix 1 section 2.1.1), taking into account temperature and barometric pressure variation during testing. The fixed-volume enclosure must be constructed with rigid panels that maintain a fixed enclosure volume, and meet the requirements below. The enclosure must be equipped with an outlet flow stream that withdrawns air at a low, constant rate from the enclosure throughout the test. An inlet flow stream may provide make-up air to balance the outgoing flow with incoming ambient air. Inlet air must be filtered with activated carbon to provide a relatively constant hydrocarbon level. Any method of volume accommodation must maintain the differential between the enclosure internal pressure and the barometric pressure between 0 and -5 hPa. The equipment must be capable of measuring the mass of hydrocarbon in the inlet and outlet flow streams with a resolution of 0,01 gram. A bag sampling system may be used to collect a proportional sample of the air withdrawn from and admitted to the enclosure. Alternatively, the inlet and outlet flow streams may be continuously analysed using an on-line FID analyser and integrated with the flow measurements to provide a continuous record of the mass hydrocarbon removal. The atmosphere within the chamber is monitored using a hydrocarbon detector of the flame ionization detector (FID) type. Sample gas must be drawn from the mid-point of one side wall or roof of the chamber and any bypass flow must be returned to the enclosure, preferably to a point immediately downstream of the mixing fan. The hydrocarbon analyser must have a response time to 90 % of final reading of less than 1,5 seconds. Its stability must be better than 2 % of full scale at zero and at 80 % ± 20 % of full scale over a 15-minute period for all operational ranges. The repeatability of the analyser expressed as one standard deviation must be better than 1 % of full scale deflection at zero and at 80 % ± 20 % of full scale on all ranges used. The operational ranges of the analyser must be chosen to give best resolution over the measurement, calibration and leak checking procedures. The hydrocarbon analyser must be fitted with a device to record electrical signal output either by strip chart recorder or other data processing system at a frequency of at least once per minute. The recording system must have operating characteristics at least equivalent to the signal being recorded and must provide a permanent record of results. The record must show a positive indication of the beginning and end of the hot soak or diurnal emission test (including beginning and end of sampling periods along with the time elapsed between start and completion of each test). The fuel in the vehicle tank(s) must be heated by a controllable source of heat; for example a heating pad of 2 000 W capacity is suitable. The heating system must apply heat evenly to the tank walls beneath the level of the fuel so as not to cause local overheating of the fuel. Heat must not be applied to the vapour in the tank above the fuel. The tank heating device must make it possible to heat the fuel in the tank evenly by 14 oK from 289 oK (16 oC) within 60 minutes, with the temperature sensor position as in 5.1.1. The heating system must be capable of controlling the fuel temperature to ± 1,5 oK of the required temperature during the tank heating process. The temperature in the chamber is recorded at two points by temperature sensors which are connected so as to show a mean value. The measuring points are extended approximately 0,1 m into the enclosure from the vertical centre line of each side wall at a height of 0,9 ± 0,2 m.
The temperatures of the fuel tank(s) are recorded by means of the sensor positioned in the fuel tank as in 5.1.1 in the case of use of the gasoline canister load option (5.1.5). Temperatures must, throughout the evaporative emission measurements, be recorded or entered into a data processing system at a frequency of at least once per minute. The accuracy of the temperature recording system must be within ± 1,0 oK and the temperature must be capable of being resolved to ± 04, oK. The recording or data processing system must be capable of resolving time to ± 15 seconds. The difference Δp between barometric pressure within the test area and the enclosure internal pressure must, throughout the evaporative emission measurements, be recorded or entered into a data processing system at a frequency of at least once per minute. The accuracy of the pressure recording system must be within ± 2 hPa and the pressure must be capable of being resolved to ± 0,2 hPa. By the use of one or more fans or blowers with the SHED door(s) open it must be possible to reduce the hydrocarbon concentration in the chamber to the ambient hydrocarbon level. The chamber must have one or more fans or blowers of likely capacity 0,1 to 0,5 m3s-1 with which to thoroughly mix the atmosphere in the enclosure. It must be possible to attain an even temperature and hydrocarbon concentration in the chamber during measurements. The vehicle in the enclosure must not be subjected to a direct stream of air from the fans or blowers. nitrogen (N2), 98 % minimum purity. Calibration and span gases must be available containing mixtures of propane (C3H8) and purified synthetic air. The true concentrations of a calibration gas must be within ± 2 % of stated figures. The accuracy of the diluted gases obtained when using a gas divider must be to within ± 2 % of the true value. The concentrations specified in Appendix 1 may also be obtained by the use of a gas divider using synthetic air as the diluent gas. The absolute humidity in the tests area must be measurable to within ± 5 %. the manufacturer may propose a test method in order to take into account the loss of hydrocarbons by evaporation coming only from the fuel system of the vehicle. The vehicle is taken into the test area where the ambient temperature is between 293 oK and 303 oK (20 and 30 oC). The ageing of the canister(s) has to be verified. This may be done by demonstrating that it has accumulated a minimum of 3 000 km. If this demonstration is not given, the following procedure is used. In the case of a multiple canister system each canister must undergo the procedure separately. The canister is removed from the vehicle. Special care must be taken during this step to avoid damage to components and the integrity of the fuel system. The weight of the canister must be checked. The canister is connected to a fuel tank, possibly an external one, filled with reference fuel, to 40 % volume of the fuel tank(s). The fuel temperature in the fuel tank must be between 283 oK (10 oC) and 287 oK (14 oC). The (external) fuel tank is heated from 288 oK to 318 oK (15 o to 45 oC) (1 oC increase every 9 minutes). If the canister reaches breakthrough before the temperature reaches 318 oK (45 oC), the heat source must be turned off. Then the canister is weighed. If the canister did not reach breakthrough during the heating to 318 oK (45o oC), the procedure from 5.1.3.3 must be repeated until breakthrough occurs. Breakthrough may be checked as is described in 5.1.5 and 5.1.6 of this Annex, or with the use of another sampling and analytical arrangement capable of detecting the emission of hydrocarbons from the canister at breakthrough. The canister must be purged with 25 ± 5 litres per minute with the emission laboratory air until 300 bed volume exchanges are reached. The steps of the procedure in 5.1.3.4 to 5.1.3.9 must be repeated nine times. The test may be terminated prior to that, after not less than three ageing cycles, if the weight of the canister after the last cycles has stabilized. The evaporative emission canister is reconnected and the vehicle restored to its normal operating condition. One of the methods specified in 5.1.5 and 5.1.6 must be used to precondition the evaporative canister. For vehicles with multiple canisters, each canister must be preconditioned separately. Canister emissions are measured to determine breakthrough. Breakthrough is here defined as the point at which the cumulative quantity of hydrocarbons emitted is equal to 2 grams. Breakthrough may be verified using the evaporative emission enclosure as described in 5.1.5 and 5.1.6 respectively. Alternatively, breakthrough may be determined using an auxiliary evaporative canister connected downstream of the vehicle's canister. The auxiliary canister must be well purged with dry air prior to loading. The measuring chamber must be purged for several minutes immediately before the test until a stable background is obtained. The chamber air mixing fan(s) must be switched on at this time. The hydrocarbon analyser must be zeroed and spanned immediately before the test. The fuel tank(s) of the vehicle(s) is (are) emptied using the fuel tank drain(s). This must be done so as not to abnormally purge or abnormally load the evaporative control devices fitted to the vehicle. Removal of the fuel cap is normally sufficient to achieve this. The fuel tank(s) is (are) refilled with test fuel at a temperature of between 283 oK to 287 oK (10 to 14 oC) to 40 % ± 2 % of the tank's normal volumetric capacity. The fuel cap(s) of the vehicle must be fitted at this point. Within one hour of being refuelled the vehicle must be placed, with the engine shut off, in the evaporative emission enclosure. The fuel tank temperature sensor is connected to the temperature recording system. A heat source must be properly positioned with respect to the fuel tank(s) and connected to the temperature controller. The heat source is specified in 4.4. In the case of vehicles fitted with more than one fuel tank, all the tanks must be heated in the same way as described below. The temperatures of the tanks must be identical to within ± 1,5 oK. The fuel may be artificially heated to the starting diurnal temperature of 293 oK (20 oC) ± 1 oK. When the fuel temperature reaches at last 292 oK (19 oC), the following steps must be taken immediately: the purge blower must be turned off; enclosure doors closed and sealed; and measurement initiated of the hydrocarbon level in the enclosure. When the fuel temperature of the fuel tank reaches 293 oK (20 oC) a linear heat build of 15 oK (15 oC) begins. The fuel must be heated in such a way that the temperature of the fuel during the heating conforms to the function below to within ± 1,5 oK. The elapsed time of the heat build and temperature rise is recorded. time from start of the tank heat build in minutes. As soon as breakthrough occurs or when the fuel temperature reaches 308 oK (35 oC), whichever occurs first, the heat source is turned off, the enclosure doors unsealed and opened, and the vehicle fuel tank cap(s) removed. If breakthrough has not occurred by the time the fuel temperature 308 oK (35 oC), the heat source is removed from the vehicle, the vehicle removed from the evaporative emission enclosure and the entire procedure outlined in 5.1.7 repeated until breakthrough occurs. If the enclosure is used for the determination of the breakthrough (see 5.1.4.2) the vehicle must be placed, with the engine shut off, in the evaporative emission enclosure. The evaporative emission canister must be prepared for the canister loading operation. The canister must not be removed from the vehicle, unless access to it in its normal location is so restricted that loading can only reasonably be accomplished by removing the canister from the vehicle. Special care must be taken during this step to avoid damage to the components and the integrity of the fuel system. The canister is loaded with a mixture composed of 50 % butane and 50 % nitrogen by volume at a rate of 40 grams butane per hour. As soon as the canister reaches breakthrough, the vapour source must be shut off. The evaporative emission canister must then be reconnected and the vehicle restored to its normal operating condition. The fuel tank(s) is (are) refilled with test fuel at a temperature of between 291 oK ± 8 oK (18 ± 8 oC) to 40 ± 2 % of the tank's normal volumetric capacity. The fuel cap(s) of the vehicle must be fitted at this point. Within one hour from the completing of canister loading in accordance with 5.1.5 or 5.1.6 the vehicle is placed on the chassis dynamometer and driven through one Part One and two Part Two driving cycles of Type I test as specified in Annex III. Exhaust emissions are not sampled during this operation. Within five minutes of completing the preconditioning operation specified in 5.2.1 the engine bonnet must be completely closed and the vehicle driven off the chassis dynamometer and parked in the soak area. The vehicle is parked for a minimum of 12 hours and a maximum of 36 hours. The engine oil and coolant temperatures must have reached the temperature of the area or within ± 3 oK of it at the end of the period. After conclusion of the soak period the vehicle is driven through a complete Type I test drive as described in Annex III (cold start urban and extra urban test). Then the engine is shut off. Exhaust emissions may be sampled during this operation but the results must not be used for the purpose of exhaust emission type-approval. Within two minutes of completing the Type I test drive specified in 5.4.1 the vehicle is driven a further conditioning drive consisting of one urban test cycle (hot start) of a Type I test. Then the engine is shut off again. Exhaust emissions need not be sampled during this operation. Before the completion of the conditioning drive the measuring chamber must be purged for several minutes until a stable hydrocarbon background is obtained. The enclosure mixing fan(s) must also be turned on at this time. The hydrocarbon analyser must be zeroed and spanned immediately prior to the test. At the end of the conditioning drive the engine bonnet must be completely closed and all connections between the vehicle and the test stand disconnected. The vehicle is then driven to the measuring chamber with a minimum use of the accelerator pedal. The engine must be turned off before any part of the vehicle enters the measuring chamber. The time at which the engine is switched off is recorded on the evaporative emission measurement data recording system and temperature recording begins. The vehicle's windows and luggage compartments must be opened at this stage, if not already opened. The vehicle must be pushed or otherwise moved into the measuring chamber with the engine switched off. The enclosure doors are closed and sealed gas-tight within two minutes of the engine being switched off and within seven minutes of the end of the conditioning drive. The start of a 60 ± 0,5 minute hot soak period begins when the chamber is sealed. The hydrocarbon concentration, temperature and barometric pressure are measured to give the initial readings CHC,i Pi and Ti for the hot soak test. These figures are used in the evaporative emission calculation, section 6. The ambient SHED temperature T must not be less than 296 oK and no more than 304 oK during the 60-minute hot soak period. The hydrocarbon analyser must be zeroed and spanned immediately before the end of the 60 ± 0,5 minute test period. At the end of the 60 ± 0,5 minute test period the hydrocarbon concentration in the chamber must be measured. The temperature and the barometric pressure are also measured. These are the final readings CHC,f, Pf and Tf for the hot soak test used for the calculation in section 6. The test vehicle must be pushed or otherwise moved to the soak area without use of the engine and soaked for not less than 6 hours and not more than 36 hours between the end of the hot soak test and the start of the diurnal emission test. For at least 6 hours of this period the vehicle must be soaked at 293 oK ± 2 oK (20 oC ± 2 oC). The test vehicle must be exposed to one cycle of ambient temperature according to the profile specified in Appendix 2 with a maximum deviation of ± 2 oK at any time. The average temperature deviation from the profile, calculated using the absolute value of each measured deviation, must not exceed 1 oK. Ambient temperature must be measured at least every minute. Temperature cycling begins when time tstart = 0, as specified in 5.7.6. The measuring chamber must be purged for several minutes immediately before the test until a stable background is obtainable. The chamber mixing fan(s) must also be switched on at this time. The test vehicle, with the engine shut off and the test vehicle windows and luggage compartment(s) opened must be moved into the measuring chamber. The mixing fan(s) must be adjusted in such a way as to maintain a minimum air circulation of 8 km/h under the fuel tank of the test vehicle. The enclosure doors must be closed and gas-tight sealed. Within 10 minutes of closing and sealing the doors, the hydrocarbon concentration, temperature and barometric pressure are measured to give the initial readings CHC,i, Pf and Tf for the diurnal test. This is the point where time tStart = 0. The hydrocarbon analyser must be zeroed and spanned immediately before the end of the test. The end of the emission sampling period occurs 24 hours ± 6 minutes after the beginning of the initial sampling, as specified in 5.7.6. The time elapsed is recorded. The hydrocarbon concentration, temperature and barometric pressure are measured to give the final readings CHC,i, Pf and Tf for the diurnal test used for the calculation in section 6. This completes the evaporative emission test procedure. The evaporative emission tests described in section 5 allow the hydrocarbon emissions from the diurnal and hot soak phases to be calculated. Evaporative losses from each of theses phases is calculated using the initial and final hydrocarbon concentrations, temperatures and pressures in the enclosure, together with the net enclosure volume. mass of hydrocarbon exiting the enclosure, in the case of fixed-volume enclosures for diurnal emission testing (grams). mass of hydrocarbon entering the enclosure, in the case of fixed-volume enclosures for diurnal emission testing (grams). net enclosure volume in cubic metres corrected for the volume of the vehicle, with the windows and the luggage compartment open. If the volume of the vehicle is not determined a volume of 1,42 m3 is subtracted. is taken to be 2,20 for hot soak losses. All equipment must be calibrated before its initial use and then calibrated as often as necessary and in any case in the month before type-approval testing. The calibration methods to besued are described in this Appendix. Normally the series of temperatures which are mentioned firstly must be used. The series of temperatures within square brackets may alternatively be used. Before its initial use, the internal volume of the chamber must be determined as follows. The internal dimensions of the chamber are carefully measured, allowing for any irregularities such as bracing struts. The internal volume of the chamber is determined from these measurements. For variable-volume enclosures, the enclosure must be latched to a fixed volume when the enclosure is held at an ambient temperature of 303 oK (30 oC) [(302 oK (29 oC)]. This nominal volume must be repeatable within ± 0,5 % of the reported value. The net internal volume is determined by subtracting 1,42 m3 from the internal volume of the chamber. Alternatively the volume of the test vehicle with the luggage compartment and windows open may be used instead of the 1,42 m3. The chamber must be checked as in 2.3. If the propane mass does not agree with the injected mass to within ± 2 % then corrective action is required. This operation determines that the chamber does not contain any materials that emit significant amounts of hydrocarbons. The check must be carried out at the enclosure's introduction to service, after any operations in the enclosure which may affect background emissions and at a frequency of at least once per year. Variable-volume enclosures may be operated in either latched or unlatched volume configuration, as described in 2.1.1 Ambient temperatures must be maintained at 308 oK ± 2 oK (35o ± 2 oC) [309 oK ± 2 oK (36o ± 2 oC)|, throughout the 4-hour period mentioned below. Fixed volume enclosures must be operated with inlet and outlet flow streams closed. Ambient temperatures must be maintained at 308 oK ± 2 oK (35o ± 2 oC) [309 oK ± 2 oK ( 36o ± 2 oC)] throughout the four-hour period mentioned below. The enclosure may be sealed and the mixing fan operated for a period of up to 12 hours before the four-hour background sampling period begins. The analyser (if required) must be calibrated, then zeroed and spanned. The enclosure must be purged until a stable hydrocarbon reading is obtained, and the mixing fan turned on if not already on. The chamber is then sealed and the background hydrocarbon concentration, temperature and barometric pressure are measured. These are the initial readings CHC,i, Pi and Ti used in the enclosure background calculation. The enclosure is allowed to stand undisturbed with the mixing fan on for a period of four hours. At the end of this time the same analyser is used to measure the hydrocarbon concentration in the chamber. The temperature and the barometric pressure are also measured. These are the final readings CHC,f, Pf and Tf. The change in mass of hydrocarbons in the enclosure must be calculated over the time of the test in accordance with 2.4 and must not exceed 0,05 g.
The calibration and hydrocarbon retention test in the chamber provides a check on the calculated volume in 2.1 and also measures any leak rate. The enclosure leak rate must be determined at the enclosure's introduction to service, after any operations in the enclosure which may affect the integrity of the enclosure, and at least monthly thereafter. If six consecutive monthly retention checks are successfully completed without corrective action, the enclosure leak rate may be determined quarterly thereafter as long as no corrective action is required. The enclosure must be purged until a stable hydrocarbon concentration is reached. The mixing fan is turned on, if not already switched on. The hydrocarbon analyser is zeroed, calibrated if required, and spanned. On variable-volume enclosures the enclosure must be latched to the nominal volume position. On fixed-volume enclosures the outlet and inlet flow streams must be closed. The ambient temperature control system is then turned on (if not already on) and adjusted for an initial temperature of 308 oK (35 oC) [309 oK (36 oC)]. When the enclosure stabilizes at 308 oK ± 2 oK (35o ± 2 oC) [309 oK ± 2 oK (36o ± 2 oC)], the enclosure is sealed and the background concentration, temperature and barometric pressure measured. These are the initial readings CHC,i, Pi and Ti used in the enclosure calibration. A quantity of approximately 4 grams of propane is injected into the enclosure. The mass of propane must be measured to an accuracy and precision of ± 02, % of the measured value. The contents of the chamber must be allowed to mix for five minutes and then the hydrocarbon concentration, temperature and barometric pressure are measured. These are the final readings CHC,f, Pf and Tf for the calibration of the enclosure as well as the initial readings CHC,i, Pi and Ti for the retention check. On the basis of the readings taken in 2.3.4 and 2.3.6 and the formula in 2.4, the mass of propane in the enclosure is calculated. This must be within ± 2 % of the mass of propane measured in 2.3.5..
For variable-volume enclosures the enclosure must be unlatched from the nominal volume configuration. For fixed-volume enclosures, the outlet and inlet flow streams must be opened. The process is then begun of cycling the ambient temperature from 308 oK (35 oC) to 293 oK (20 oC) and back to 308 oK (35 oC) [308,6 oK (35,6 oC) to 295,2 oK (22,2 oC) and back to 308,6 oK (35,6 oC)] over a 24-hour period according to the profile [alternative profile] specified in Appendix 2 within 15 minutes of sealing the enclosure. (Tolerances as specified in section 5.7.1 of Annex VI). At the completion of the 24-hour cycling period, the final hydrocarbon concentration, temperature and barometric pressure are measured and recorded. These are the final readings CHC,f, Tf and Pf for the hydrocarbon retention check. Using the formula in 2.4, the hydrocarbon mass is then calculated from the readings taken in 2.3.10 and 2.3.6. The mass may not differ by more than 3 % from the hydrocarbon mass given by 2.3.7. The calculation of net hydrocarbon mass change within the enclosure is used to determine the chamber's hydrocarbon background and leak rate. Initial and final readings of hydrocarbon concentration, temperature and barometric pressure are used in the following formula to calculate the mass change. enclosure volume in cubic metres as measured in section 2.1.1. Test procedures and data requirements. This chapter deals with the equipment needed for low ambient temperature exhaust emission tests on positive-ignition vehicles. Equipment required and specifications are equivalent to the requirements for the Type I test as specified in Annex III, with appendices, if specific requirements for the Type VI test are not prescribed. Sections 2.2 to 2.6 describe deviations applicable to Type VI low ambient temperature testing. The requirements of section 4.1 of Annex III apply. The dynamometer must be adjusted to simulate the operation of a vehicle on the road at 266 oK (-7 o C). Such adjustment may be based on a determination of the road load force profile at 266 oK (-7 o C). Alternatively the driving resistance determined according to Appendix 3 of Annex III may be adjusted for a 10 % decrease of the coast-down time. The technical service may approve the use of other methods of determining the driving resistance. For calibration of the dynamometer the provisions of Appendix 2 of Annex III apply. The provisions of section 4.3 of Annex III apply, but only for carbon monoxide, carbon dioxide, and hydrocarbon testing. For calibrations of the analytical equipment the provisions of Appendix 6 of Annex III apply. The provisions of section 4.5 of Annex III apply, where they are relevant. For equipment used for the measurement of volume, temperature, pressure and humidity the provisions in sections 4.4 and 4.6 of Annex III apply. not be less than 260 oK (-13 oC), no more than 272 oK (-1 oC). for more than three consecutive minutes. The test cell temperature monitored during testing must be measured at the output of the cooling fan (section 5.2.1 of this Annex). The ambient temperature reported must be an arithmetic average of the test cell temperatures measured at constant intervals no more than one minute apart. 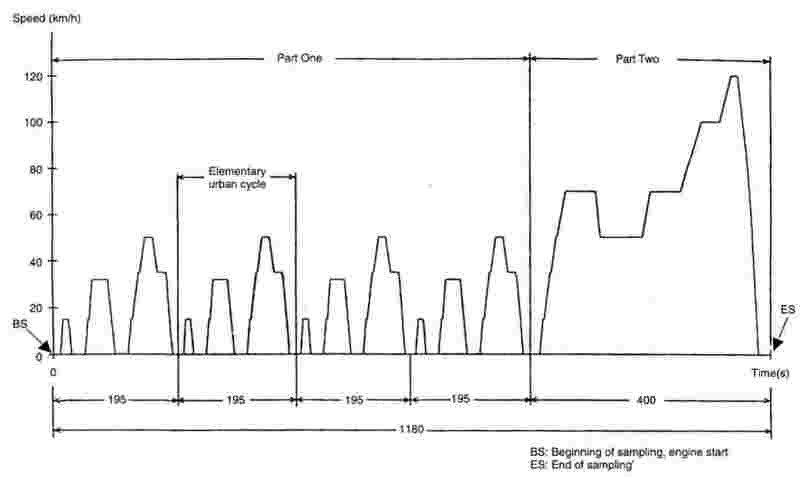 The part one urban driving cycle according to Figure III.1.1 in Annex III - Appendix 1, consists of four elementary urban cycles which together makes a complete part one cycle. Start of engine, start of the sampling and the operation of the first cycle must be in accordance with Table III.1.2 and Figure III. 1.2. For the test vehicle the provisions of section 3.1 of Annex III apply. For setting the equivalent inertia mass on the dynamometer the provisions of section 5.1 of Annex III apply. The test fuel used must have the specification that follows from the provisions in section 3 of Annex IX. A manufacturer may chose to use the test fuel specified in section 1 of Annex IX. To ensure reproducible emission tests, the test vehicles must be conditioned in a uniform manner. The conditioning consists of a preparatory drive on a chassis dynamometer followed by a soak period before the emission test according to 4.3. The fuel tank(s) must be filled with the specified test fuel. If the existing fuel in the fuel tank(s) does not meet the specifications contained in 3.4.1, the existing fuel must be drained prior to the fuel fill. The test fuel must be at a temperature less than or equal to 289 oK (+ 16 oC). For the above operations the evaporative emission control system must neither be abnormally purged nor abnormally loaded. The vehicle is moved to the test cell and placed on the chassis dynamometer. The preconditioning consists of the driving cycle according to Annex III — Appendix 1 Figure III.1.1, parts one and two. At the request of the manufacturer, vehicles with a positive-ignition engine may be preconditioned with one Part I and two Part II driving cycles. During the preconditioning the test cell temperature must remain relatively constant and not be higher than 303 oK (30 oC). The drive-wheel tyre pressure must be set in accordance with the provisions of section 5.3.2 of Annex III. Within ten minutes of completion of the preconditioning, the engine must be switched off. If requested by the manufacturer and approved by the technical service, additional preconditioning may in exceptional cases be allowed. The technical service may also choose to conduct additional preconditioning. The additional preconditioning consists of one or more driving schedules of the part one cycle as described in Annex III — Appendix 1. The extent of such additional preconditioning must be recorded in the test report. One of the following two methods, to be selected by the manufacturer, must be utilized to stabilize the vehicle before the emission test. 266 oK (-7 oC) ± 3 oK during each hour of this period and must not be less than 260 oK (-13 oC) nor more than 272 (-1 oC). In addition, the temperature may not fall below 263 oK (-10 oC) nor more than 269 oK (-4 oC) for more than three consecutive minutes. Forced method (15). The vehicle must be stored for not more than 36 hours prior to the low ambient temperature tailpipe emission test. The vehicle must not be stored at ambient temperatures which exceed 303 oK (30 oC) during this period. Vehicle cooling may be accomplished by force-cooling the vehicle to the test temperature. If cooling is augmented by fans, the fans must be placed in a vertical position so that the maximum cooling of the drive train and engine is achieved and not primarily the sump. Fans must not be placed under the vehicle. as determined by a representative bulk oil temperature. A representative bulk oil temperature is the temperature of the oil measured near the middle of the oil, not at the surface or at the bottom of the oil sump. If tow or more diverse locations in the oil are monitored, they must all meet the temperature requirements. must average 266 oK (-7 oC) ± 3 oK and must not be less than 260 oK (-13 oC) nor more than 272 oK (-1 oC). not fall below 263 oK (-10 oC) or exceed 269 oK (-4 oC), for more than three consecutive minutes. The emission sampling is performed over a test procedure consisting of the part one cycle (Annex III — Appendix 1 Figure III. 1.1). Engine start-up, immediate sampling, operation over the part one cycle and engine shut-down make a complete low ambient temperature test, with a total test time of 780 seconds. The tailpipe emissions are diluted with ambient air and a continuously proportional sample is collected for analysis. The exhaust gases collected in the bag are analysed for hydrocarbons, carbon monoxide, and carbon dioxide. A parallel sample of the dilution air is similarly analysed for carbon monoxide, hydrocarbons and carbon dioxide. A cooling fan is positioned so that cooling air is appropriately directed to the radiator (water cooling) or to the air intake (air-cooling) and to the vehicle. For front-engined vehicles, the fan must be positioned in front of the vehicle, within 300 mm of it. In the case of rear-engined vehicles or if the above arrangement is impractical, the cooling fan must be positioned so that sufficient air is supplied to cool the vehicle. height of the lower edge above ground: approximately 20 cm. As an alternative the blower speed must be at least 6 m/s (21,6 km/h). At the request of the manufacturer, for special vehicles (e. g. vans, off-road) the height of the cooling fan may be modified. The vehicle speed as measured from the dynamometer roll(s) must be used (section 4.1.4.4 of Annex III). Preliminary testing cycles may be carried out if necessary, to determine how best to actuate the accelerator and brake controls so as to achieve a cycle approximating to the theoretical cycle within the prescribed limits, or to permit sampling system adjustment. Such driving must be carried out before “START” according to Figure VII. 1. Humidity in the air must be kept low enough to prevent condensation on the dynamometer roll(s). The dynamometer must be thoroughly warmed as recommended by the dynamometer manufacturer, and using procedures or control methods that assure stability of the residual frictional horsepower. The time between dynamometer warming and the start of the emission test must be no longer than 10 minutes if the dynamometer bearings are not independently heated. If the dynamometer bearings are independently heated, the emission test must begin no longer than 20 minutes after dynamometer warming. If the dynamometer horsepower must be adjusted manually, it must be set within one hour prior to the tailpipe emission test phase. The test vehicle may not be used to make the adjustment. The dynamometer, using automatic control of preselectable power settings, may be set at any time prior to the beginning of the emission test. Before the emission test driving schedule may begin, the test cell temperature must be 266 oK (-7 oC) ± 2 oK, as measured in the air stream of the cooling fan with a maximum distance of 1 m-1,5 m from the vehicle. The total driving distance or roller revolutions measured are recorded. A four-wheel drive vehicle must be tested in a two-wheel drive mode of operation. The determination of the total road force for dynamometer setting is performed while operating the vehicle in its primary designed driving mode. The provisions of sections 6.2 to 6.6, excluding 6.2.2, of Annex III apply in respect of starting the engine, carrying out the test and taking the emission samples. The sampling begins before or at the initiation of the engine start-up procedure and ends on conclusion of the final idling period of the last elementary cycle of the part one (urban driving cycle), after 780 seconds. The first driving cycle starts with a period of 11 seconds idling as soon as the engine has started. For the analysis of the sampled emissions the provisions of section 7.2 of Annex III apply. In performing the exhaust sample analysis the technical service must exercise care to prevent condensation of water vapour in the exhaust gas sampling bags. For the calculations of the mass emissions the provisions of section 8 of Annex III apply. Any irrational emission control strategy which results in a reduction in effectiveness of the emission control system under normal operating conditions at low temperature driving, so far as not covered by the standardized emission tests, may be considered a defeat device. Annexes VII, VIII and IX become Annexes VIII, IX and X. This Annex applies to the functional aspects of on-board diagnostic (OBD) system for the emission control of motor vehicles. ‘OBD’ means an on-board diagnostic system for emission control which must have the capability of identifying the likely area of malfunction by means of fault codes stored in computer memory. ‘Vehicle type’ means a category of power-driven vehicles which do not differ in such essential engine and OBD system characteristics as defined in Appendix 2. ‘Vehicle family’ means a manufacturer's grouping of vehicles which, through their design, are expected to have similar exhaust emission and OBD system characteristics. Each engine of this family must have complied with the requirements of this Directive. ‘Emission control system’ means the electronic engine management controller and any emission-related component in the exhaust or evaporative system which supplies an input to or receives an output from this controller. ‘Malfunction indicator (MI)’ means a visible or audible indicator that clearly informs the driver of the vehicle in the event of a malfunction of any emission-related component connected to the OBD system, or the OBD system itself. ‘Malfunction’ means the failure of an emission-related component or system that would result in emissions exceeding the limits in section 3.3.2. ‘Secondary air’ refers to air introduced into the exhaust system by means of a pump or aspirator valve or other means that is intended to aid in the oxidation of HC and CO contained in the exhaust gas stream. ‘Engine misfire’ means lack of combustion in the cylinder of a positive-ignition engine due to absence of spark, poor fuel metering, poor compression or any other cause. In terms of OBD monitoring it is that percentage of misfires out of a total number of firing events (as declared by the manufacturer) that would result in emissions exceeding the limits given in section 3.3.2 or. that percentage that could lead to an exhaust catalyst, or catalysts, overheating causing irreversible damage. ‘Type I test’ means the driving cycle (Parts One and Two) used for emission approvals, as detailed in Annex III, Appendix 1. ‘A driving cycle’ consists of engine start-up, driving mode where a malfunction would be detected if present, and engine shut-off. ‘A warm-up cycle’ means sufficient vehicle operation such that the coolant temperature has risen by a least 22 oK from engine starting and reaches a minimum temperature of 343 oK (70 oC). ‘Fuel trim’ refers to feedback adjustments to the base fuel schedule. Short-term fuel trim refers to dynamic or instantaneous adjustments. Long-term fuel trim refers to much more gradual adjustments to the fuel calibration schedule than short-term trim adjustments. These long-term adjustments compensate for vehicle differences and gradual changes that occur over time. ‘Permanent emission default mode’ refers to a case where the engine management controller permanently switches to a setting that does not require an input from a failed component or system where such a failed component or system would result in an increase in emissions from the vehicle to a level above the limits given in section 3.3.2. ‘Power take-off unit’ means an engine-driven output provision for the purposes of powering auxiliary, vehicle mounted, equipment. ‘Access’ means the availability of all emission-related OBD data including all fault codes required for the inspection, diagnosis, servicing or repair of emissions-related parts of the vehicle, via the serial interface for the standard diagnostic connection (pursuant to Appendix 1, section 6.5.3.5 of this Annex). access allowing evaluation of the data produced without the need for any unique decoding information, unless that information itself is standardised. ‘Standardised’ means that all data stream information, including all fault codes used, shall be produced only in accordance with industry standards which, by virtue of the fact that their format and their permitted options are clearly defined, provide for a maximum level of harmonisation in the motor vehicle industry, and whose use is expressly permitted in this Directive. 3.1. All vehicles must be equipped with an OBD system so designed, constructed and installed in a vehicle as to enable it to identify types of deterioration or malfunction over the entire life of the vehicle. In achieving this objective the approval authority must accept that vehicles which have travelled distances in excess of the Type V durability distance, referred to in 3.3.1, may show some deterioration in OBD system performance such that the emission limits given in 3.3.2 may be exceeded before the OBD system signals a failure to the driver of the vehicle. Access to the OBD system required for the inspection, diagnosis, servicing or repair of the vehicle must be unrestricted and standardised. All emission-related fault codes must be consistent with ISO DIS 15031-6 (SAE J 2012, dated July 1996). No later than three months after the manufacturer has provided any authorised dealer or repair shop within the Community with repair information, the manufacturer shall make that information (including all subsequent amendments and supplements) available upon reasonable and non-discriminatory payment and shall notify the approval authority accordingly. In the event of failure to comply with these provisions the approval authority shall take appropriate measures to ensure that repair information is available, in accordance with the procedures laid down for type-approval and in-service surveys. 3.2. The OBD system must be so designed, constructed and installed in a vehicle as to enable it to comply with the requirements of this Annex during conditions of normal use. A manufacturer may disable the OBD system if its ability to monitor is affected by low fuel levels. Disablement must not occur when the fuel tank level is above 20 % of the nominal capacity of the fuel tank. A manufacturer may disable the OBD system at ambient engine starting temperatures below 266 oK (-7 oC) or at elevations over 2 500 metres above sea level provided the manufacturer submits data and/or an engineering evaluation which adequately demonstrate that monitoring would be unreliable when such conditions exist. A manufacturer may also request disablement of the OBD system at other ambient engine starting temperatures if he demonstrates to the authority with data and/or an engineering evaluation that misdiagnosis would occur under such conditions. For vehicles designed to accommodate the installation of power take-off units, disablement of affected monitoring systems is permitted provided disablement occurs only when the power take-off unit is active. Manufacturers may adopt higher misfire percentage malfunction criteria than those declared to the authority, under specific engine speed and load conditions where it can be demonstrated to the authority that the detection of lower levels of misfire would be unreliable. Manufacturers who can demonstrate to the authority that the detection of higher levels of misfire percentages is still not feasible may disable the misfire monitoring system when such conditions exist. The test are carried out on the vehicle used for the Type V durability test, given in Annex VIII, and using the test procedure in Appendix I to this Annex. Tests are carried out at the conclusion of the Type V durability testing. When no Type V durability testing is carried out, or at the request of the manufacturer, a suitably aged and representative vehicle may be used for these OBD demonstration tests. a line joining the following engine operating points: the positive torque line at 3 000 min-1 and a point on the maximum speed line defined in (a) above with the engine's manifold vacuum at 13,33 kPa lower than that at the positive torque line. the electronic evaporative emission purge control must, at a minimum, be monitored for circuit continuity. Other emission control system components or systems, or emission-related powertrain components or systems, which are connected to a computer, the failure of which may result in tailpipe emissions exceeding the limits given in 3.3.2. Examples of such systems or components are those for monitoring and control of air mass-flow, air volumetric flow (and temperature), boost pressure and inlet manifold pressure (and relevant sensors to enable these functions to be carried out). Any other emission-related powertrain component connected to a computer must be monitored for circuit continuity. 3.3.5. Manufacturers may demonstrate to the approval authority that certain components or systems need not be monitored if, in the event of their total failure or removal, emissions do not exceed the emission limits given in 3.3.2. 3.4. A sequence of diagnostic checks must be initiated at each engine start and completed at least once provided that the correct test conditions are met. The test conditions must be selected in such a way that they all occur under normal driving as represented by the Type I test. The OBD system must incorporate a malfunction indicator readily perceivable to the vehicle operator. The MI must not be used for any other purpose except to indicate emergency start-up or limp-home routines to the driver. The MI must be visible in all reasonable lighting conditions. When activated, it must display a symbol in conformity with ISO 2575 (39). A vehicle must not be equipped with more than one general purpose MI for emission-related problems. Separate specific purpose telltales (e. g. brake system, fasten seat belt, oil pressure, etc.) are permitted. The use of red for an MI is prohibited. For strategies requiring more than two preconditioning cycles for MI activation, the manufacturer must provide data and/or an engineering evaluation which adequately demonstrates that the monitoring system is equally effective and timely in detecting component deterioration. Strategies requiring on average more than 10 driving cycles for MI activation are not accepted. The MI must also activate whenever the engine control enters a permanent emission default mode of operation if the emission limits given in 3.3.2 are exceeded. The MI must operate in a distinct warning mode, e. g. a flashing light, under any period during which engine misfire occurs at a level likely to cause catalyst damage, as specified by the manufacturer. The MI must also activate when the vehicle's ignition is in the ‘key-on’ position before engine starting or cranking and de-activate after engine starting if no malfunction has previously been detected. The OBD system must record code(s) indicating the status of the emission-control system. Separate status codes must be used to identify correctly functioning emission control systems and those emission control systems which need further vehicle operation to be fully evaluated. Fault codes that cause MI activation due to deterioration or malfunction or permanent emission default modes of operation must be stored and that fault code must identify the type of malfunction. In the case of vehicles equipped with positive-ignition engines, misfiring cylinders need not be uniquely identified if a distinct single or multiple cylinder misfire fault code is stored. For misfire malfunctions at levels likely to cause catalyst damage (as specified by the manufacturer), the MI may be switched to the normal mode of activation if the misfire is not present any more, or if the engine is operated after changes to speed and load conditions where the level of misfire will not cause catalyst damage. For all other malfunctions, the MI may be de-activated after three subsequent sequential driving cycles during which the monitoring system responsible for activating the MI ceases to detect the malfunction and if no other malfunction has been identified that would independently activate the MI. The OBD system may erase a fault code and the distance travelled and freeze-frame information if the same fault is not re-registered in at least 40 engine warm-up cycles. This Appendix describes the procedure of the test according to section 5 of this Annex. The procedure describes a method for checking the function of the on-board diagnostic (OBD) system installed on the vehicle by failure simulation of relevant systems in the engine management or emission control system. It also sets procedures for determining the durability of OBD systems. The manufacturer must make available the defective components and/or electrical devices which would be used to simulate failures. When measured over the Type I test cycle, such defective components or devices must not cause the vehicle emissions to exceed the limits of section 3.3.2 by more than 20 %. When the vehicle is tested with the defective component or device fitted, the OBD system is approved if the MI is activated. determining whether the OBD system reacts to the simulated malfunction and indicates malfunction in an appropriate manner to the vehicle driver. Alternatively, at the request of the manufacturer, malfunction of one or more components may be electronically simulated according to the requirements of section 6. Manufacturers may request that monitoring take place outside the Type I test cycle if it can be demonstrated to the authority that monitoring during conditions encountered during the Type I test cycle would impose restrictive monitoring conditions when the vehicle is used in service. The test vehicle must meet the requirements of section 3.1 of Annex III. The appropriate reference fuel as described in Annex IX must be used for testing. The test temperature and pressure must meet the requirements of the Type I test as described in Annex III. 6.1. The operating cycle on the chassis dynamometer must meet the requirements of Annex III. According to the engine type and after introduction of one of the failure modes given in 6.3, the vehicle must be preconditioned by driving at least two consecutive Type I tests (Parts One and Two). For compression-ignition engined vehicles an additional preconditioning of two Part Two cycles is permitted. At the request of the manufacturer, alternative preconditioning methods may be used. Replacement of the catalyst with a deteriorated or defective catalyst or electronic simulation of such a failure. Engine misfire conditions according to the conditions for misfire monitoring given in section 3.3.3.2 of this Annex. Replacement of the oxygen sensor with a deteriorated or defective oxygen sensor or electronic simulation of such a failure. Electrical disconnection of any other emission-related component connected to a powertrain management computer. Electrical disconnection of the electronic evaporative purge control device (if equipped). For this specific failure mode, the Type I test must not be performed. Where fitted, replacement of the catalyst with a deteriorated or defective catalyst or electronic simulation of such a failure. Where fitted, total removal of the particulate trap or, where sensors are an integral part of the trap, a defective trap assembly. Electrical disconnection of any fuelling system electronic fuel quantity and timing actuator. In meeting the requirements of 6.3.2.3 and 6.3.2.4, and with the agreement of the approval authority, the manufacturer must take appropriate steps to demonstrate that the OBD system will indicate a fault when disconnection occurs. After vehicle preconditioning according to 6.2, the test vehicle is driven over a Type I test (Parts One and Two). The MI must activate before the end of this test under any of the conditions given in 6.4.1.2 to 6.4.1.5. The technical service may substitute those conditions by others in accordance with 6.4.1.6. However, the total number of failures simulated must not exceed 4 for the purpose of type-approval. Replacement of a catalyst with a deteriorated or defective catalyst or electronic simulation of a deteriorated or defective catalyst that results in emissions exceeding the HC limit given in section 3.3.2 of this Annex. An induced misfire condition according to the conditions for misfire monitoring given in section 3.3.3.2 of this Annex that results in emissions exceeding any of the limits given in 3.3.2. Replacement of an oxygen sensor with a deteriorated or defective oxygen sensor or electronic simulation of a deteriorated or defective oxygen sensor that results in emissions exceeding any of the limits given in section 3.3.2 of this Annex. Electrical disconnection of the electronic evaporative purge control device (if equipped). Electrical disconnection of any other emission-related powertrain component connected to a computer that results in emissions exceeding any of the limits given in section 3.3.2 of this Annex. After vehicle preconditioning according to 6.2, the test vehicle is driven over a Type I test (Parts One and Two). The MI must activate before the end of this test under any of the conditions given in 6.4.2.2 to 6.4.2.5. The technical service may substitute those conditions by others in accordance with 6.4.2.5. However, the total number of failures simulated must not exceed four for the purposes of type approval. Where fitted, replacement of a catalyst with a deteriorated or defective catalyst or electronic simulation of a deteriorated or defective catalyst that results in emissions exceeding limits given in section 3.3.2 of this Annex. Where fitted, total removal of the particulate trap or replacement of the particulate trap with a defective particulate trap meeting the conditions of 6.3.2.2 that results in emissions exceeding the limits given in section 3.3.2 of this Annex. With reference to 6.3.2.5, disconnection of any fuelling system electronic fuel quantity and timing actuator that results in emissions exceeding any of the limits given in section 3.3.2 of this Annex. With reference to 6.3.2.5, disconnection of any other emission-related powertrain component connected to a computer that results in emissions exceeding any of the limits given in section 3.3.2 of this Annex. Upon determination of the first malfunction of any component or system, ‘freeze-frame’ engine conditions present at the time must be stored in computer memory. Should a subsequent fuel system or misfire malfunction occur, any previously stored freeze-frame conditions must be replaced by the fuel system or misfire conditions (whichever occurs first). Stored engine conditions must include, but are not limited to calculated load value, engine speed, fuel trim value(s) (if available), fuel pressure (if available), vehicle speed (if available), coolant temperature, intake manifold pressure (if available), closed- or open-loop operation (if available) and the fault code which caused the data to be stored. The manufacturer must choose the most appropriate set of conditions facilitating effective repairs for freeze-frame storage. Only one frame of data is required. Manufacturers may choose to store additional frames provided that at least the required frame can be read by a generic scan tool meeting the specifications of 6.5.3.2 and 6.5.3.3. If the fault code causing the conditions to be stored is erased in accordance with section 3.7 of this Annex, the stored engine conditions may also be erased. If available, the following signals in addition to the required freeze-frame information must be made available on demand through the serial port on the standardized data link connector, if the information is available to the on-board computer or can be determined using information available to the on-board computer: diagnostic trouble codes, engine coolant temperature, fuel control system status (closed-loop, open-loop, other), fuel trim, ignition timing advance, intake air temperature, manifold air pressure, air flow rate, engine speed, throttle position sensor output value, secondary air status (upstream, downstream or atmosphere), calculated load value, vehicle speed and fuel pressure. The signals must be provided in standard units based on the specifications given in 6.5.3. Actual signals must be clearly identified separately from default value or limp-home signals. In addition, the capability to perform bi-directional diagnostic control based on the specifications given in 6.5.3 must be made available on demand through the serial port on the standardized data link connector according to the specifications given in 6.5.3. For all emission control systems for which specific on-board evaluation tests are conducted (catalyst, oxygen sensor, etc. ), except misfire detection, fuel system monitoring and comprehensive component monitoring, the results of the most recent test performed by the vehicle and the limits to which the system is compared must be made available through the serial data port on the standardized data link connector according to the specifications given in 6.5.3. For the monitored components and systems excepted above, a pass/fail indication for the most recent test results must be available through the data link connector. The OBD requirements to which the vehicle is certified (i. e. this Annex or the alternative requirements specified in section 5 of Annex I) and the major emission control systems monitored by the OBD system consistent with 6.5.3.3 must be available through the serial data port on the standardized data link connector according to the specifications given in 6.5.3. 6.5.2. The emission control diagnostic system is not required to evaluate components during malfunction if such evaluation would result in a risk to safety or component failure. 6.5.3. The emission control diagnostic system must provide for standardised and unrestricted access and conform with the following ISO and/or SAE standards. Some of the ISO standards have been derived from Society of Automotive Engineers Standards and Recommended Practices. Where this is the case, the appropriate SAE reference appears in parentheses. ISO 11519-4 ‘Road Vehicles — Low Speed Serial Data Communication — Part 4: Class B Data Communication Interface (SAE J1850)’. Emission-related messages must use the cyclic redundancy check and the three-byte header and not use inter-byte separation or checksums. ISO DIS 14230 — Part 4 ‘Road Vehicles — Diagnostic Systems — Keyword Protocol 2000’. Test equipment and diagnostic tools needed to communicate with OBD systems must meet or exceed the functional specification given in ISO DIS 15031-4. Basic diagnostic data, (as specified in 6.5.1) and bi-directional control information must be provided using the format and units described in ISO DIS 15031-5 and must be available using a diagnostic tool meeting the requirements of ISO DIS 15031-4. When a fault is registered, the manufacturer must identify the fault using the most appropriate fault code consistent with those given in section 6.3 of ISO DIS 15031-6 (SAE J2012 — dated July 1996), relating to ‘... Powertrain system diagnostic trouble codes’. The fault codes must be fully accessible by standardized diagnostic equipment complying with the provisions of 6.5.3.2. The note in section 6.3 of ISO DIS 15031-6 (SAE J2012 — dated July 1996) immediately preceding the list of fault codes in the same section does not apply. The connection interface between the vehicle and the diagnostic tester must meet all the requirements of ISO DIS 15031-3. The installation position must be subject to agreement of the approval authority such that it is readily accessible by service personnel but protected from tampering by non-qualified personnel. The manufacturer must also make accessible, where appropriate upon payment, to repairers who are not undertakings within the distribution system, the technical information required for the repair or maintenance of motor vehicles unless that information is covered by an intellectual property right or constitutes essential, secret know-how which is identified in an appropriate form; in such case, the necessary technical information must not be withheld improperly. The OBD family may be defined by basic design parameters which must be common to vehicles within the family. In some cases there may be interaction of parameters. These effects must also be taken into consideration to ensure that only vehicles with similar exhaust emission characteristics are included within an OBD family. To this end, those vehicle types whose parameters described below are identical are considered to belong to the same engine-emission control/OBD system combination. method of engine fuelling (i. e. carburettor or fuel injection). the methods of OBD functional monitoring, malfunction detection and malfunction indication to the vehicle driver. (1) As defined in Part A of Annex II to Directive 70/156/EEC. (2) OJ L 36, 9.2.1998, p. 33. (3) The Commission will as soon as possible, but not later than 31 December 1999, propose value limits for Classes II and III, in accordance with the procedure laid down in Article 13 of Directive 70/156/EEC. These value limits shall be applied no later than 2003. (6) Except vehicles the maximum mass of which exceeds 2 500 kg. (8) This section is applicable to new types from 1 January 2002. (9) The Commission will, as soon as possible, but not later than 31 December 1999, propose limit values for Classes II and III, in accordance with the procedure laid down in Article 13 of Directive 70/156/EEC. These limit values shall be applied no later than 2003. (10) For compression-ignition engined vehicles. Atomic ratio of oxygen to carbon [0,0175]. 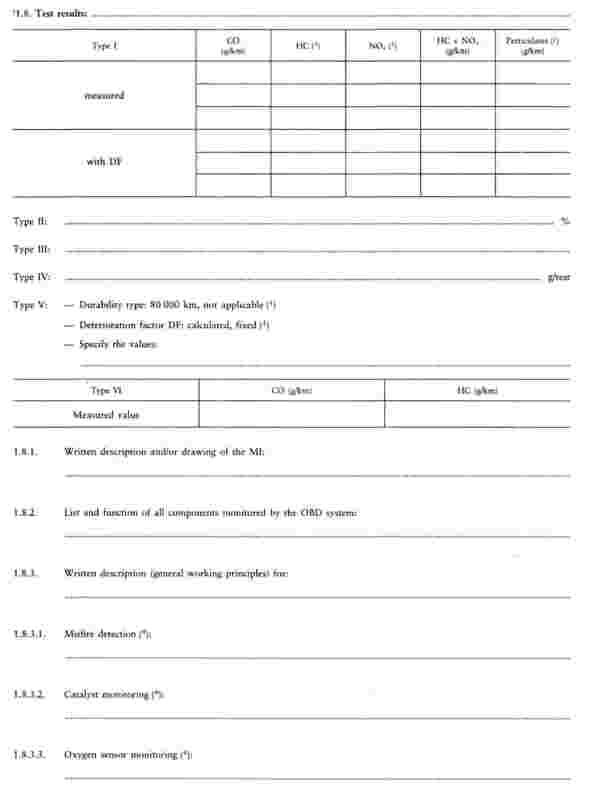 (12) Sections 7.1.1 and 7.1.2 will be re-examined and completed without delay in accordance with the procedure laid down in Article 13 of Directive 70/156/EEC while taking into account the particular problems associated with vehicles in Category N1 and with the vehicles in Category M referred to in footnote 2 to the table in section 5.3.1.4. Proposals must be submitted in good time for their adoption before the dates laid down in Article 2(3). (13) The provisions laid down in Appendix 4 must be re-examined and completed without delay in accordance with the procedure laid down in Article 13 of Directive 70/156/EEC. (15) The provisions concerning “forced cool down methods” must be re-examined without delay in accordance with the procedure laid down in Article 13 of Directive 70/156/EEC. (16) The values quoted in the specification are “true values”. In establishment of their limit values the terms of ISO 4259 “Petroleum products — Determination and application of precision data in relation to methods of test” have been applied and in fixing a minimum value, a minimum difference of 2R above zero has been taken into account; in fixing a maximum and minimum value, the minimum difference is 4R (R = reproducibility). Notwithstanding this measure, which is necessary for statistical reasons, the manufacturer of fuels should nevertheless aim at a zero value where the stipulated maximum value is 2R and at the mean value in the case of quotations of maximum and minimum limits. Should it be necessary to clarify the question as to whether a fuel meets the requirements of the specifications, the terms of ISO 4259 should be applied. (17) The month of publication will be completed in due course. (18) The reference fuel used to approve a vehicle against the limit values set out in row B of the table in section 5.3.1.4 of Annex I to this Directive shall have a maximum aromatics content of 35 % v/v. The Commission will as soon as possible, but no later than 31 December 1999, bring forward a modification to this Annex reflecting the market average for fuel aromatics content in respect of the fuel defined in Annex III of Directive 98/70/EC. (19) The fuel may contain oxidation inhibitors and metal deactivators normally used to stabilise refinery gasoline streams, but detergent/dispersive additives and solvent oils must not be added. (20) The actual oxygen content of the fuel for the Type I and IV tests shall be reported. In addition the maximum oxygen content of the reference fuel used to approve a vehicle against the limit values set out in row B of the table in section 5.1.3.4 of the Annex I to this Directive shall be 2,3 %. The Commission will as soon as possible, but no later than 31 December 1999, bring forward a modification to this Annex reflecting the market average for fuel oxygen content of the fuel defined in Annex III of Directive 98/70/EC. (21) The actual sulphur content of the fuel used for the Type I test shall be reported. In addition the reference fuel used to approve a vehicle against the limit values set out in row B of the table in section 5.1.3.4 of Annex I to this Directive shall have a maximum sulphur content of 50 ppm. The Commission will as soon as possible, but no later than 31 December 1999, bring forward a modification to this Annex reflecting the market average for fuel sulphur content in respect of the fuel defined in Annex III of Directive 98/70/EC. (22) The values quoted in the specification are “true values”. In establishment of their limit values the terms of ISO 4259 “Petroleum products — Determination and application of precision data in relation to methods of test” have been applied and in fixing a minimum value, a minimum difference of 2R above zero has been taken into account; in fixing a maximum and minimum value, the minimum difference is 4R (R = reproducibility). Notwithstanding this measure, which is necessary for statistical reasons, the manufacturer of fuels should nevertheless aim at a zero value where the stipulated maximum value is 2R and at the mean value in the case of quotations of maximum and minimum limits. Should it be necessary to clarify the question as to whether a fuel meets the requirements of the specifications, the terms of ISO 4259 should be applied. (23) The range for cetane number is not in accordance with the requirement of a minimum range of 4R. However, in the case of a dispute between fuel supplier and fuel user, the terms in ISO 4259 may be used to resolve such disputes provided replicate measurements, of sufficient number to archive the necessary precision, are made in preference to single determinations. (24) The month of publication will be completed in due course. (25) The actual sulphur content of the fuel used for the Type 1 test shall be reported. In addition the reference fuel used to approve a vehicle against the limit values set out in row B of the table in section 5.1.3.4 of Annex I to this Directive shall have a maximum sulphur content of 50 ppm. The Commission will as soon as possible, but no later than 31 December 1999, bring forward a modification to this Annex reflecting the market average for fuel sulphur content in respect of the fuel defined in Annex III of Directive 98/70/EC. (26) Even though oxidation stability is controlled, it is likely that shelf life will be limited. Advice should be sought from the supplier as to storage conditions and life. (27) Petrol having the specification in the above table must be used in low ambient temperature Type VI testing, if the manufacturer does not specifically choose the fuel in section 1 of this Annex in accordance with section 3.4 of Annex VII. (28) The values quoted in the specification are “true values”. In establishment of their limit values the terms of ISO 4259 “Petroleum products — Determination and application of precision data in relation to methods of test” have been applied and in fixing a minimum value, a minimum difference of 2R above zero has been taken into account; in fixing a maximum and minimum value, the minimum difference is 4R (R = reproducibility). (29) The month of publication will be completed in due course. (30) The reference fuel used to approve a vehicle against the limit values set out in row B of the table in section 5.3.1.4 of Annex I to this Directive shall have a maximum aromatics content of 35 % v/v. The Commission will as soon as possible, but no later than 31 December 1999, bring forward a modification to this Annex reflecting the market average for fuel aromatics content in respect of the fuel defined in Annex III of Directive 98/70/EC. (31) The fuel may contain oxidation inhibitors and metal deactivators normally used to stabilise refinery gasoline streams, but detergent/dispersive additives and solvent oils must not be added. (32) The actual oxygen content of the fuel used for the Type I and IV tests shall be reported. In addition the maximum oxygen content of the reference fuel used to approve a vehicle against the limit values set out in row B of the table in section 5.1.3.4 of Annex I to this Directive shall be 2,3 %. The Commission will as soon as possible, but no later than 31 December 1999, bring forward a modification to this Annex reflecting the market average for fuel oxygen content in respect of the fuel defined in Annex III of Directive 98/70/EC. (34) Lambda formula: see Annex I, section 5.3.7.3, footnote 1.’. (35) For compression ignition engines. (36) Except vehicles the maximum mass of which exceeds 2 500 kg. (37) And those Category M vehicles which are specified in note 2. (38) The Commission proposal referred to in Article 3(1) of this Directive shall contain the threshold limit values for OBD for 2005/6 for M1 and N1 vehicles. (39) International Standard ISO 2575-1982 (E), entitled ‘Road vehicles — Symbols for controls indicators and tell-tales’, Symbol Number 4.36. (40) This requirement is only applicable to vehicles with an electronic speed input to the engine management provided the ISO standards are completed within a lead time compatible with the application of the technology. It applies to all vehicles entering into service from 1 January 2005. In the event of negotiations with ACEA not coming to a successful conclusion, the Commission undertakes to consider the introduction of binding legislation. The Commission will consider the role of chemical fuel additives in reducing vehicle emissions and will consider proposing measures to ensure or promote the appropriate use of such additives. In the context of the roadworthiness test for vehicle emissions covered by Directive 96/96/EC the Commission will consider possible improvements and will submit an appropriate proposal before the end of 1998 to improve the effectiveness of roadworthiness testing of vehicles including, inter alia, quality assurance for test results. In making its proposal according to Article 3 of Directive 98/69/EC, the Commission will propose a coherent approach for durability that includes the extension of durability distance, the possible deletion of the type V test and the respective provisions for in-use compliance testing. In making this proposal, the Commission will take account of the requirements applicable in third countries. The European Parliament and the Council take note of the ongoing discussions between the Commission and the European Automobile Manufacturers Association (ACEA) regarding a voluntary undertaking by the industry to reduce the average CO2 emissions from passenger vehicles. The European Parliament and the Council express the hope that the discussions produce an early and acceptable result. They welcome improvements to ACEA's draft commitment since March 1998, but stress the need to resolve ambiguities and outstanding issues at the earliest possible opportunity and in the light of the aim of reducing average passenger car fuel consumption to 120 g of CO2/km.